The E91V Direct Luminaire is a contemporary styled fixture fit for modern interiors. They are designed to be pendant mounted via a rigid or cord pendant making them adaptable for a number of ceiling types and applications.This fixture is ideal for offices, libraries, schools, etc. The fixture is a direct light fixture. 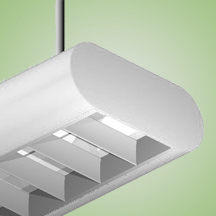 The fixture is ideal for direct general illumination with no glare and an aesthetically pleasing housing. Provided with a parabolic aluminum louver. The housing is constructed of rigid extruded aluminum to provide a light weight load to walls. Fixtures can be individually mounted or installed in a continuous row.